S.T. Nandasara is a long serving prominent academic since 1980, in the Faculty of Medicine and then from 1981 in the Faculty of Science of the University of Colombo, Sri Lanka. He developed the first ever national web site for Sri Lanka in 1996 while being a researcher on the WIDE Project at University of Keio, Japan. The site was officially launch in July, 1996 as the national web site of Sri Lanka (www.lk). Later he joined hands with the Internet Research and Development Unit of NUS, Singapore to transform www.lk to be a multilingual national portal available in Sinhala, Tamil and English. Later, he served as the project coordinator for the Kothmale Community Internet Radio Project, from 1998 to1999. The project was commissioned to assess the potential benefits of new communication technologies to remote areas by providing Internet facilities through the www.kirana.lk in all three languages. Nandasara was a Member of the Forum for Multilingual Information Processing (MLIT) and Asian Forum for Standardization of Information processing (AFSIT) both were established by Center of the International Cooperation for Computerization (CICC) form 1997 to 2001. He also served as a committee member of the project for the “Cultural Diversity and Information Network - CDIN”, National Graduate Institute for Policy Studies (GRIPS), Tokyo, form 2002 to2004 to construct a network of science, culture and information through international comparative studies. He was a co-leader of the Asian Language Resource Network Project from 2005 to 2008 of Nagaoka University of Technology, Japan and is a member of IFIP’s Working Group of the History of Computer Education. Nandasara initiated the incorporation of Sinhala and Tamil capabilities into the personal computers in1990s for DOS systems. This work, using Sinhala standards (Sri Lanka Sinhala Standard Code for Information Interchange - SLASCII), created the first ever Sinhala/English bilingual character based API, called SBIOS (Sinhala BIOS), and TBIOS (Tamil BIOS) for Tamil/English bilingual character based API. Sinhala keyboard layout that and Tamil keyboard layout was used with very popular trilingual word processor WT ver. 1.0 (well known by then as ‘WadanTharuwa’ à·€à¶¯à¶±à·Šà¶­à¶»à·”à·€ developed by S. T. Nandasara). During the mid 1990s and the introduction of desktop publishing (DTP) with PCs, there was a demand for quality printing on desktop computers. The first attempt to introduce desktop publishing for the IBM-PC was made with Xerox Ventura. However, Xerox offered no technical support for installing non-roman fonts. Thanks to the tag concept, which Ventura featured for formatting text and paragraphs, Nandasara developed the ‘Athwela’ (à¶…à¶­à·Šà·€à·à¶½) software in 1994 to support trilingual (Sinhala, Tamil, and English) DTP with Ventura. This move in character-rendering technology with bitmapped font technology for laser printers opened the way for the next stage of text processing, and it coincided with the emergence of new designs for the Sinhala character code. Any 300dpi Laser Printer & 24 pin Dot Matrix Printers were supported and more than 100 deferent Sinhala & Tamil Bitmap fonts was developed. This product was marketed by the Computing Services center of the Institute of Computer Technology of the University of Colombo. Nandasara has been a member of many Working Committees, recommending standards on use of Sinhala and Tamil in information technology development and implementation. 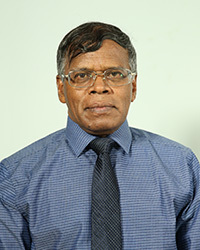 He was a member of the Sectoral Committee on Information Technology of the Sri Lanka Standard Institute (1993-2008). Nandasara was the National Coordinator and a Member for the ISO WG2 (1997-1998), by closely working with ISO and the Unicode Consortium, he was instrumental in standardization of Sinhala scripts. Nandasara is also an alumni of University of Colombo and holds a special degree in development studies in Mathematics and statistics. Hardware Maintenance and Repairing of BBC Computers, University of Reading, United Kingdom, May 1984 to September 1984. Logic of Programs by Prof. Zohar Manna (Stanford, USA), Prof. Richard Waldinger (Stanford, USA), Prof. Gilles Kahn (INRIA, France) and Prof. Gerad Berry (INRIA, France), Third Asian School on Computer Science, Asian Institute of Technology (AIT), Bangkok, Thailand, December 1988. Programming Languages: Object-Oriented, Functional, and Logic by Prof. Guy Cousineau (ENS, France), Prof. Gilles Kahn (INRIA, France), Prof. Leon Sterling (Case Western Reserve, USA) and Prof. Peter Wegner (Brown, USA), Fourth Asian School on Computer Science, “ Asian Institute of Technology (AIT), Bangkok, Thailand, November 1989. Fundamentals of Computer Graphics by Prof. Jean-Daniel Biossonat (INRIA, France), Prof. Claude Puech (ENS, France), Prof. Bernard Chazelle (Princeton, USA) and Prof. Leonidas Guibas (Stanford, USA), Fifth Asian School on Computer Science, Asian Institute of Technology, Bangkok, Thailand, December 1990. Computer Science-Algorithms and Randomness, Sixth Asian School on Computer Science, Asian Institute of Technology (AIT), Bangkok, Thailand, December 1992. Art of Digital Circuit Design – Special Course on VLSI, NECNET, Ministry of Science and Technology, Bangkok Thailand, December, 1992. Postgraduate Training in Multimedia Technology, Prof. Jun Murai Lab, Faculty of Environmental Information, University of Keio, Shonan Fugisawa Campus, Fugisawa, Japan, March 1995 to October 1995. Research and Development Training on Robust Speech Recognition, Graduate School of Engineering, Toyohashi University of Technology, 1-1 Tempaku-cho Toyohashi 441-8580 Japan, 3rd June, 2003 to 28th June, 2003. Contribution to development and implementation of Institute of Computer Technology (ICT) project - 490 million Yen Technical Grant (1986-1987). Coordinator/Negotiator – for the Project for “Human Resource Development in Information Technology through capacity building of the University of Colombo School of Computing”, 390 Million Japanese Yen Grant by Japan International Corporation Agency (JICA), (2000-2002). National Correspondent/Member (from 1997 to 2000), MLIT - Forum for Multilingual Information Processing, CICC, Japan (1997-2000). National Correspondent/Member (from 2000 to 2001), AFSIT - Asian Forum for Standardization of Information Technology, CICC, Japan (1987-2001). National Correspondent/Member (form 2002 to 2005) - AFIT - Asian Forum for Information Technology, CICC, Japan (2002-2010). National Correspondent/Member, DocSII (Document Style Information Interchange (DocSII), CICC, Japan (2003-2005). Committee Member (from 2002 to 2004), Project for the “Cultural Diversity and Information Network - CDIN”, National Graduate Institute for Policy Studies (GRIPS), Tokyo, Japan (2002-2004). Co-Leader and Researcher, Asian Language Resource Network (ALRN Project), Management & Information Systems Science, Nagaoka University of Technology (NUT) (2005-2008). Project Coordicatior, Adult Computer Literacy Project, Institute of Computer Technology, University of Colombo, October, 1988 – September, 1989. S.T.Nandasara, (2015), "Bridging the Digital Divide in Sri Lanka Some Challenges and Opportunities"
S.T.Nandasara, (2012), "Evolution of Computer Science Education in the purview of Free Education"